Crow Island School in Winnetka got a chance to “pay it forward” this summer. CROW HOPPING: Crow Island School students at play in a classroom with new furniture from VS America. The string of kindness had begun in Europe. When VS America, a furniture manufacturer from Germany, donated enough new desks and chairs to fill 20 classrooms in Crow Island’s K-4 school, Winnetka School District 36 administrators partnered with local nonprofit eAngel Community and the Archdiocese of Chicago Schools to distribute Crow Island’s high-quality, used classroom furniture to inner-city Chicago schools. On June 12, eAngel Community Director and Crow Island parent Chris Eilers, along with the chief operating officer of the Office of Catholic Schools, Tim McGrath, coordinated the large-scale moving operation, loading 20 classrooms worth of furniture into six trucks bound for a staging area on Chicago’s South Side. There, principals from the archdiocese’s network of 100 schools welcomed the trucks and worked together to allocate the pieces to area classrooms in urgent need of an upgrade. “This is a wonderful example of how eAngel builds a community of sharing, which began with the VS America gift and followed with the Crow Island donation,” eAngel Community President Roger Winship said. This fortuitous chain of giving began more than 20 years ago, when the former president and CEO of VS Furniture, Dr. Thomas Mueller, visited Crow Island to meet with the school’s former principal, Dr. Beth Herbert. Mueller, who was conducting research on furniture designed by Crow Island architect Eero Saarinen, took several of Crow Island’s original 1940s-produced desks and chairs back to Germany for display in a furniture museum on the VS America campus. 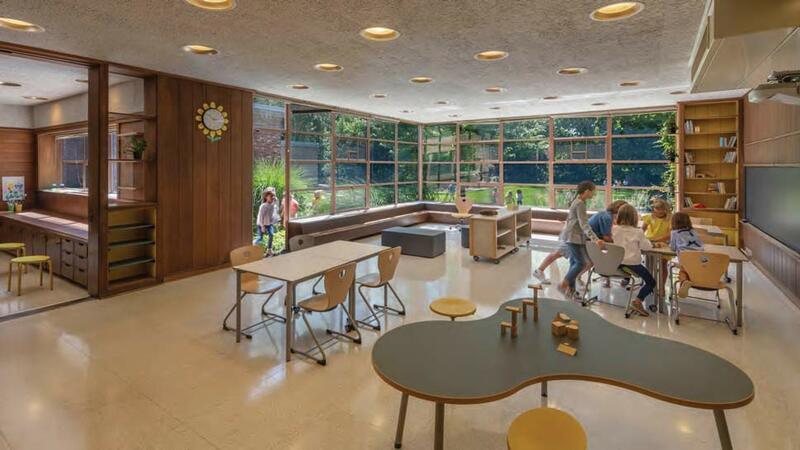 Built in 1940 as a model of progressive education, Crow Island School was one of the first to be designed in North America using the international style of architecture. The building was declared a National Historic Landmark in 1990. “It was an eclectic look,” Crow Island Principal Julie Pfeffer said, referring to Crow Island’s array of unique classroom components (before the VS America donation), with updated pieces added through the years. 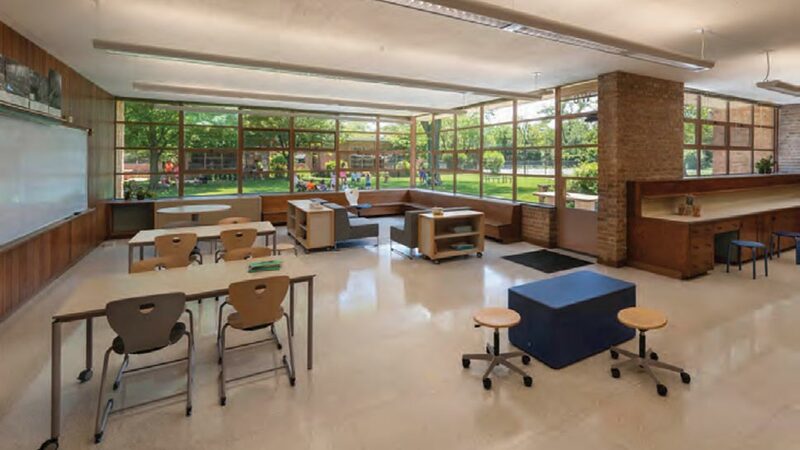 READING, WRITING, REALLY NICE FURNITURE: Crow Island School in Winnetka is home to state-of-the-art desks and chairs. Summertime offered the perfect opportunity to make the wholesale change. 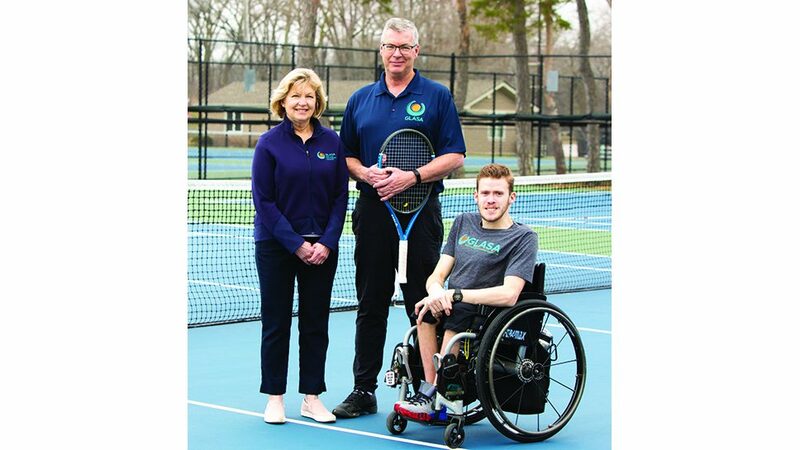 Based in Winnetka with an all-volunteer staff, eAngel Community uses its website to connect Chicago-area nonprofits with individuals and institutions looking to make noncash donations. Through its online clearinghouse, eAngelCommunity. org, the networking site seamlessly matches vetted, pre-approved nonprofits with high quality, in-kind donations, ranging from kitchen equipment and sofas to pianos and classroom furniture. Eilers says eAngel Community sparks relationships between donors and recipients that are more than just transactional and often lead to other opportunities. Although no formal plans are in place, Crow Island administrators are discussing the possibility of forging a deeper relationship with the Montessori School of Englewood, a CPS charter school—and one of the South Side schools that received an allocation of Crow Island’s used chairs, tables and bookshelves. 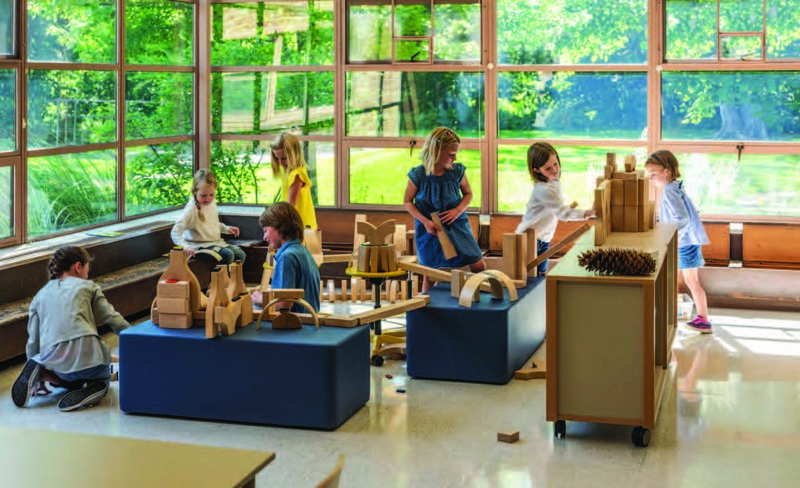 “We’re happy that we made the connection with the Montessori School, thanks to eAngel, and that they benefitted from our furniture,” Pfeffer said.